All my birds are very special to me; however the breeders are more important I think because they produce the wonderful babies that I have the opportunity to help care for and provide for. When it comes to handfeeding their babies it is so wonderful knowing that I am more or less a foster parent to these babies. So everyone here are my breeders!! 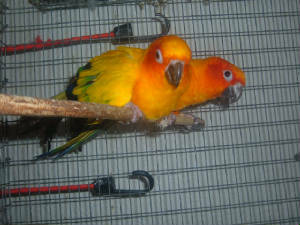 My Sun Conures named "Sunny and Cher" and the parents to "Spazz" which is on Mary's Bird Family page. 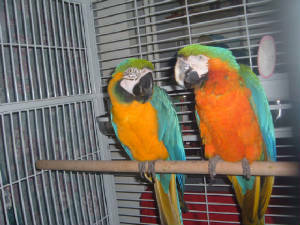 They like to dance and Sunny likes to knock.Cher passed away and I have Sunny up for sale so if interested please email me at birdloverbreeder@yahoo.com.I would like to get $350 for him and you must be willing and able to pick him up in Whitehall, NY. The Blue & Gold is named "Ray" and the Harlequin (cross of a Greenwing and a blue and gold) is named "Stevie". Ray is 10 and Stevie is 12. The babies will end up being Harlequins. Ray loves waving hello.I have them up for sale and would like $2,000 however I may come down on the price.If interested in them please email me at birdloverbreeder@yahoo.com. You must be willing and able to pick them up in Whitehall, NY. 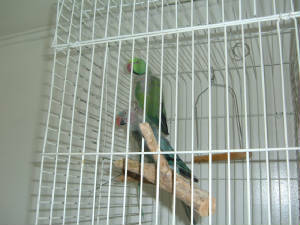 These are a pair of Indian Ringnecks.Not Sure if she is full blue or not however I believe he is split to blue.They have had babies for me.Their names are Savanna and Jeromiah.I no longer have them I traded them for a pair of sun/sunday conures.